Explore Colorado like the miners used to: via a train ride through the beautiful mountains. The Royal Gorge Route Railroad has been shuttling passengers through the stunning Royal Gorge canyon along the Arkansas River since 1879. It travels along the Denver and Rio Grande Western Railroad. This is Colorado's most famous scenic railroad and a favorite attraction in the Colorado Springs area. Trains magazine named this one of America's top trains. Beyond the views (which are enough, in and of themselves, to add this ride to your travel bucket list), the train offers food and fun themed rides, like a murder mystery train on Saturdays, twilight trains and a Santa Express Train in the winter. There are other special events, like an Oktoberfest celebration and a Mother's Day brunch. The independent, family-owned and operated Royal Gorge train was the first in Colorado to offer first-class gourmet dining and top-notch service. We’re not talking about a simple cart that offers a snack. This train has five different kitchens and four bars. It boasts the state's only full-service train ride. This ride is not a theme park and there are not carnival-like rides (although there is an amusement park at the Royal Gorge itself). This train ride is about preserving the canyon and a piece of Colorado history. Catch the Royal Gorge Route Railroad every day in Canon City, Colorado, at the Santa Fe Depot, one block south of Highway 50 and Third Street. Canon City is about 45 minutes from Colorado Springs and two hours from Denver. The train runs March through December. 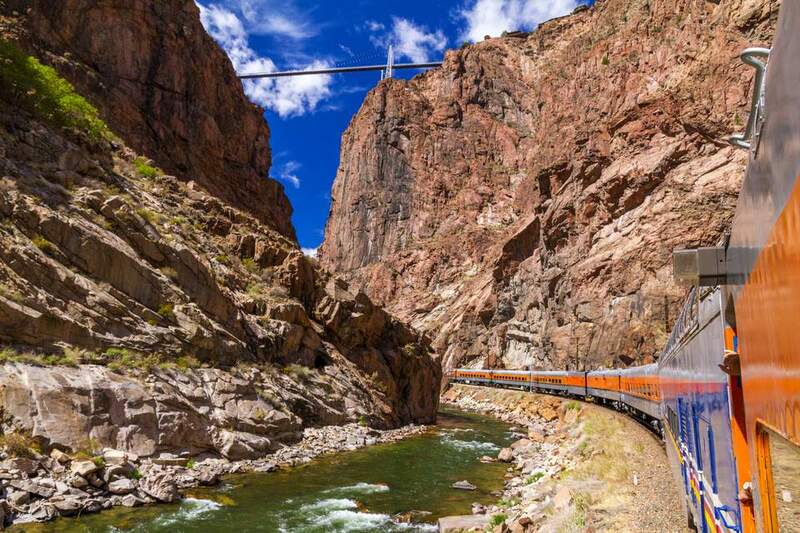 The train drives along the canyon, atop amazing 1,000-plus-foot cliffs of the Royal Gorge. The full length of the tour is 24 miles roundtrip. The scenic rides last two hours. The evening 6:30 p.m. rides are two and a half hours. Passengers travel from Canon City to Parkdale, Colorado, beneath the Royal Gorge suspension bridge. The suspension bridge is a highlight on this journey. The still-functioning bridge (yes, you can go across it during certain times of the day and season), built in 1879, is impressive. It perches 955 feet above the earth. It is the highest bridge in the country and one of the top 20 highest bridges in the world. In fact, it used to be the highest bridge in the world, until it lost the honor to a bridge in China. Also, keep your eyes peeled for wildlife, such as bald eagles and bighorn sheep. The Royal Gorge is called the “Grand Canyon of the Arkansas River.” Visit the Royal Gorge if you like stunning views (and if you're not afraid of heights). This 360-acre amusement park is built around the gorge, on both sides of the crazy suspension bridge. If you want to explore the gorge more after your train ride, you can see it via aerial gondola rides or get a thrill on a "skycoaster" or zipline. The Royal Gorge Route Railroad offers six different classes, all with different price points. Coach class: This is the cheapest option, at $49 for an adult and $44 per child (age 3 to 12). Kids under 3 ride for free on an adult’s lap. Coach still has great views through big windows, and you can order food. Club: The club class is $10 more per passenger ($59 per adult, $54 per child), but you get a table and access to a bar. Of course, food is available. Vista Domes: Choose this for the best views. Vista Dome passengers sit in comfy booths. Tickets are $74 per adult and $69 for a child. First Class Lunch Train: The First Class car includes a three-course lunch with wine. Dates vary throughout the year. Tickets are $114 per person and the minimum age is 8. Imagine Colorado's most interesting restaurant, serving locally inspired and sourced food, on wheels. First Class Dome Dinner: Get First Class service in the dome with a three-course dinner. Dates and days of the week vary. Tickets are $124 per person and again, the minimum age is 8. Locomotive seat: You can ride in the actual locomotive next to an engineer. There are only two of these seats on each ride (and they fill quickly). Tickets are $150 each. Minimum age is 13, if accompanied by an adult. The second ticket in a pair is $100. Santa Train: The winter Santa Train still offers coach, club and the dome, but tickets are slightly cheaper. For example, Santa Train’s coach seats are $44 per adult and $39 per child. Prices go up with different classes, up to $69 per adult and $64 per child for the Vista Dome. On the Santa Train, passengers get free cookies and hot chocolate. Want to try some local beer? You can find a good selection here. If you're on a budget, book the cheapest ticket and spend time in the open-air car, which is accessible to everyone, regardless of class. Make sure you bring a jacket because it can get chilly in the winter. In the summer, the sun can be aggressive, so put on sunscreen. Book early so you can get a window seat facing the river (the best seats in the car). The Royal Gorge railroad has an interesting history that all starts with silver mining in the 1800s. Railroads during that time were built to accommodate the surge in mining activity in Colorado’s mountains. It was no easy task to figure out how to build a railroad through the canyon, with its steep granite cliffs. After mining was long done, the railroad was revived as a scenic passenger train. Today, more than 100,000 people experience it every year. The railroad has been restored but retains its mid-century flair. You can also venture out into an open-air car for some fresh air and 360-degree views. As for the Royal Gorge suspension bridge, it was built in 1929 for $350,000. Today, it's a $25 million engineering marvel.